Squash Exterminating LLC has been using Integrated Pest Management(IPM) for nearly a decade in sensitive commercial accounts, such as restaurants, industrial spaces, supermarkets, institutions, schools, hospitals, day care centers, and more. We thoroughly inspect and treat infestations as needed, so as not to expose clients and residents to pesticides on a regular basis. 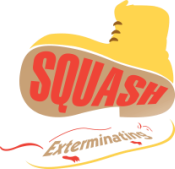 Now that roaches are making a resurgence, trust Squash Exterminating to resolve your problem. We were doing it when no chemical could eliminate roaches. Our old-fashioned methods combined with the latest technology can get roaches out and keep them out.